Our final day with the mahouts and elephants in Myanmar began with a small interlude. 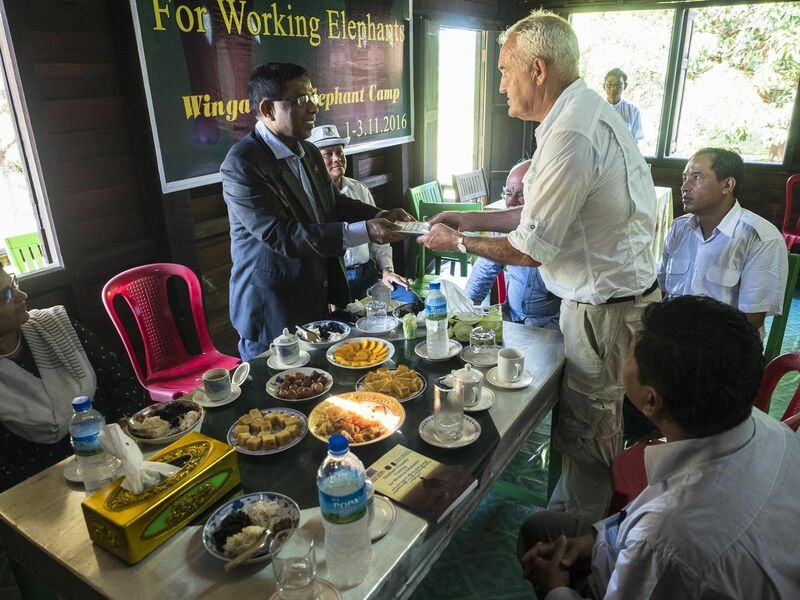 Our work here is courtesy of the Myanmar Timber Enterprise and their new facilities were to be opened this morning by the region’s Minister for Natural Resources, Forests and Environmental Conservation Mr. U Kyaw Min San . Following this opening ceremony, one 30-year-old bull elephant, a really beautiful specimen, was to be donated to Sri Lanka in an additional ceremony. The Ambassador to Sri Lanka and his wife arrived in due course. So we had a meal with these dignitaries and this gave us the chance to present both the Minister and the Ambassador with my book, Elephant-friendly training for working elephants and to explain the basis of the training project and its significance in preventing poaching of elephants, tigers and rhinos which is rife throughout Asia. They then watched our elephants go through the various training routines and it was pleasing to see how much both mahout and elephant had improved. We then took a break to escape the midday heat and returned later for the final session. In the afternoon the elephants performed at their best and it was great to see that the timing and understanding of training was understood by the mahouts. I could see that they had grasped the key concepts as they began to show ingenuity in the way they set up and shaped the training. The elephants that on the first day had resisted even touching the stick were now picking it up, giving it back and being led by it as they held it in their trunks. The mahouts even extended this to ask the elephants to hold each other’s tail while walking. They pointed to the tail and gave the command to take hold, and the elephants grasped the other’s tail. Whereas most animals need to be trained to shift their responses to other contexts, elephants are good at generalising from one thing to another. For example, once they have learned the mahout’s ridden signals on their ears and neck, it is not difficult for them to acquire other signals for control such as various pressures from the mahout’s feet on their backs while the mahout stands on their backs. When we finished this last session I gave a short talk on the importance of continuing this training and I implored these high ranking mahouts to now teach the mahouts from the various camps around Myanmar where they came from. 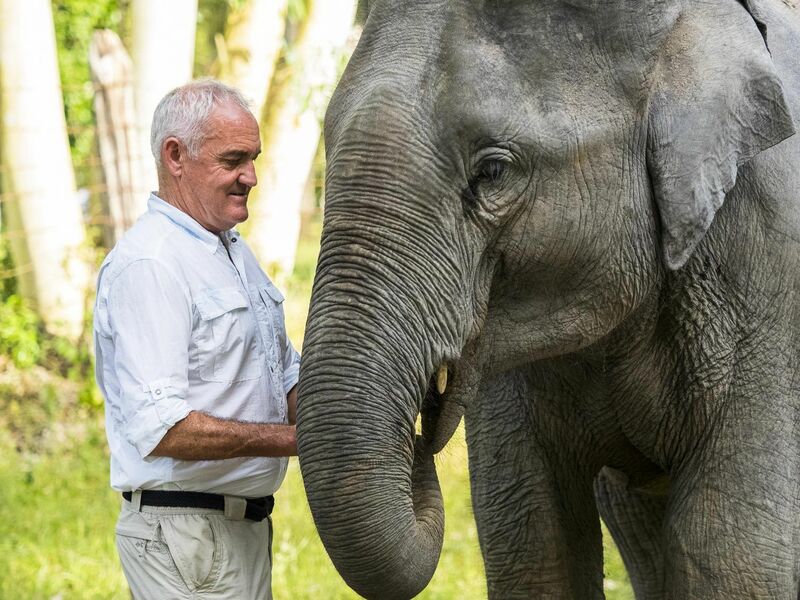 I am very pleased to have been given the opportunity to begin this project in Myanmar by the Myanmar Timber Enterprises which has around 3000 elephants plus 2500 owned privately. The MTE represents by far the biggest elephant ownership in the world. Myanmar decided to stop logging their forests and to stop using elephants for logging. The big question is – what is going to happen to the elephants now? There are only 2 choices on the table: Use the remaining elephants in eco-tourism in Myanmar or sell them to Thailand and China. Selling these animals to China represents a grisly fate. They would either be used there in entertainment and unregulated ecotourism or they would be killed and their body parts used for ivory, traditional medicine and aphrodisiacs. Whichever way, they will end up being killed for the latter. We were told from good sources that the value of the elephants for traditional medicine and ivory is about the same as their worth for entertainment. 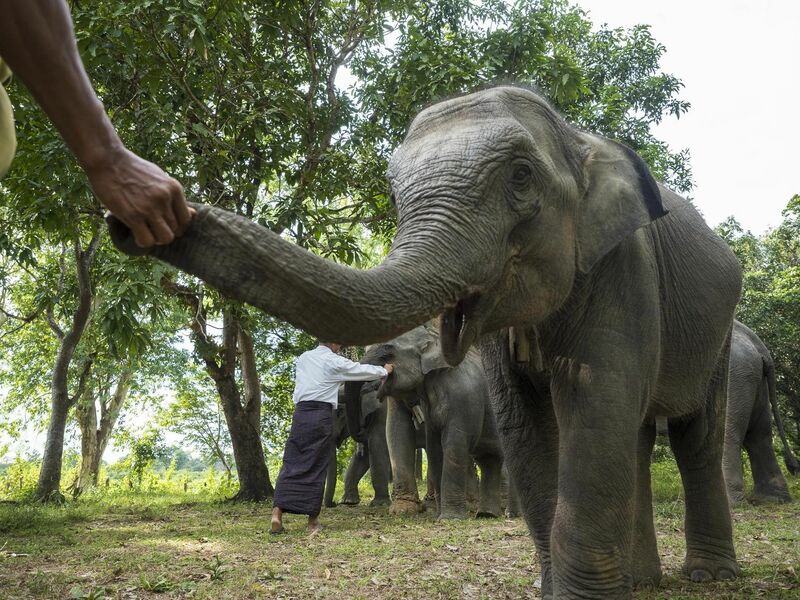 We are pushing for a third choice for the 5500 Myanmar elephants: using them for anti-poaching activities in the vast National Parks of Myanmar. India has such a successful programme of using elephants for anti-poaching that rhino numbers have now increased dramatically in Kaziranga National Park in recent years. If Myanmar did the same, the increasing poaching that is occurring in their National Parks would surely drop. There is no better vehicle for catching poachers than well-trained elephant. They are super quiet, don’t break down, can easily navigate swamps, rivers and steep terrain, face no problems from tigers, allow people to get closer to other wildlife such as rhinos and they have a sense of smell 60 times greater than a bloodhound. Our next plan is to train the elephants to sniff out poachers. Regardless, whatever happens now is critical as the elephant’s fate is being determined as I write. Animal rights groups deplore the use of elephants for tourist rides, but carefully regulated tourism may be the only way to save them. There are already just as many, if not more captive Asian elephants than wild ones and it has been understood for a long time that there isn’t enough habitat to return the captive ones to the wild – in fact there is barely enough of their shrinking habitats to maintain the existing wild ones. Even then, they’re hardly any safer. 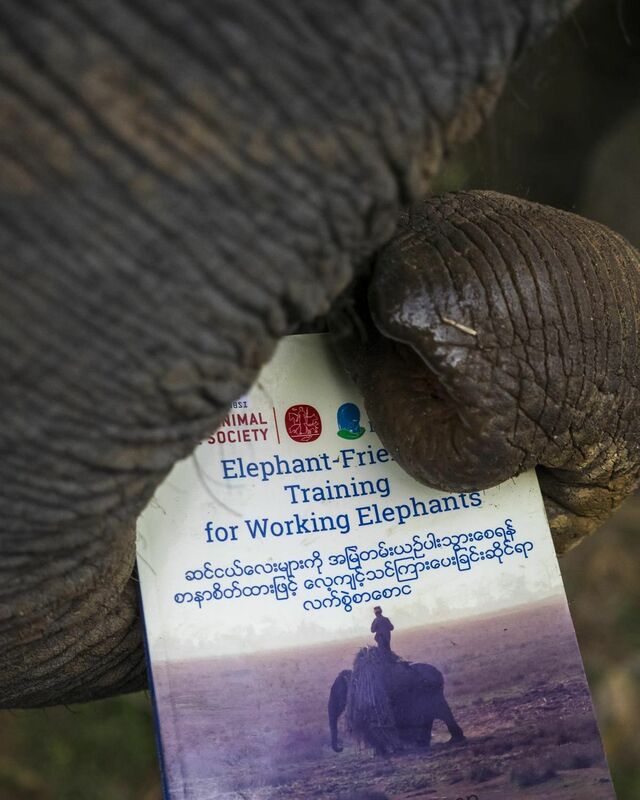 Perhaps regulating ridden elephant tourism such as limiting the hours of work, the kilograms they can carry, improving saddle design, making their training more humane and making their management and husbandry as close to their natural ways as possible is the best solution. This has already begun to happen in Thailand. Our aim is to keep going to Asia and continue to improve the training, handling and management of these incredible animals. A world without elephants, tigers and rhinos would be an empty one and there’s no going back. Please help if you can. Our thanks to all our donors who made this project possible.